We were so excited to kick off our 28th season last week. In addition to welcoming several new singers and some returning singers (many loud and happy reunions! ), we are once again looking at a great set of concerts. This season will once again feature the carefully, joyously, and fabulously programmed repertoire you’ve come to expect from maestra Jennifer Rodgers. The energy and momentum of this chorus, so largely reflected in and supported by your generosity through the Friends of VCS, has allowed us to invest in “upping our artistic game.” We have expanded our choral repertoire and singing opportunities, deepened our artistic partnerships, and prioritized time spent on our choral sound and technique. And we are ready to pour all of that into our 2015-2016 season. We’re diving in with a Concert for a Cause right up front. 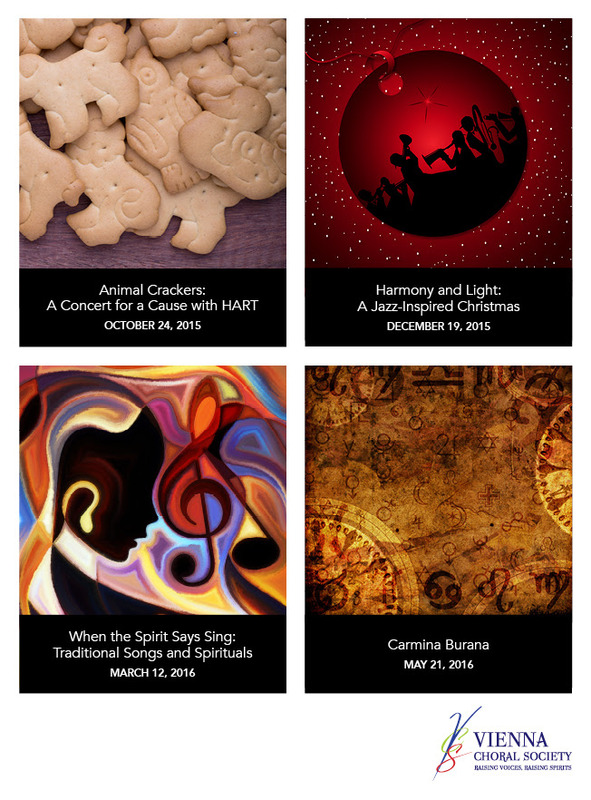 Animal Crackers will be presented in partnership with HART (Homeless Animals Rescue Team) for our October concert. We’ll have cats, birds, panthers, cows and kookaburras at the show. Well, in the music… HART will likely stick to puppies. That’s right – puppies! And we aim to end with a bang – with the ambitious creative challenge we have set for ourselves: Carmina Burana. If you’re a classical music fan, Orff’s piece needs no introduction. If you are not, you will be delighted to find out that it’s so much more than O Fortuna in very terribly macho commercials and “gopher tuna!” parodies. Carmina is big, sweeping, percussive, sacred and irreverent. It is everything we expect and love in a master work. Yet, it is accessible enough for us to sing, and for you to enjoy. Make no mistake – we have carved a niche in Northern Virginia as an excellent, creatively ambitious, and musically diverse choir to watch. It is why we can offer you an eclectic program that goes from the Beatles, to jazz, to traditional Spirituals to Carmina in the space of nine months. But it all happens with your support. Especially something like Carmina, which is expected to cost a pretty penny even though we have saved up and watched every last cent. We know you value VCS. Your support is what has made it possible for us to get this far. Won’t you help us again? Please join the Friends of VCS again this season. We’re especially excited to tell you that in addition to the rewards we have offered in the past, this season, all Friends at any level of support will receive discounts at two of our favorite vendors in Vienna – Caffe Amouri and Donato’s Pizza (Vienna) with other participating retailers to come. Make your donation today, and we’ll send you the Friends card ASAP. Our campaign runs through September 30 and our goal, ambitious as ever, is to raise $10K. If everyone on our mailing list gave $25 today, we’d more than meet our goal. I think you’ll agree that VCS is worth $25 of your support, yes? Talk to a friend in the choir today, go to our website at http://viennachoralsociety.org/contribute/friends/ or just reply to this email for more information. Thank you, and here’s to another season of great music with a wonderful audience!